Just LISTED! Darling Doll House! Private and Scenic Lot! - Shannon Doser Group and Assoc. Just LISTED! Darling Doll House! Private and Scenic Lot! 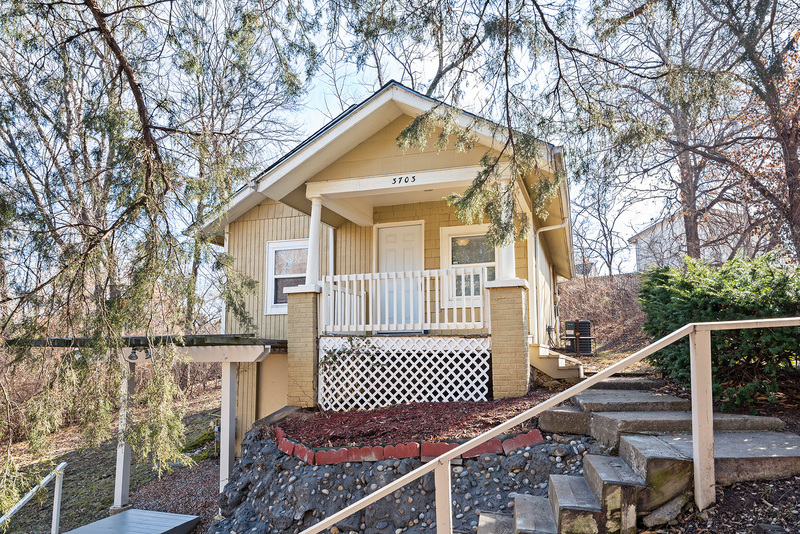 Welcome home to 3703 N. Cleveland Avenue, a darling doll house nestled amongst the trees on a private and scenic lot. You will fall in love with quality workmanship and appreciate the rehabbed electrical, plumbing, floors, Timberline roof, bath fixtures, and security system. Plus, this home offers convenient access to I-35 and I-435, and is close to Cooley, Winnwood and Chaumiere Parks, North Kansas City Hospital, and Harrah’s Hotel & Casino. Be welcomed home by a quaint covered front porch, the perfect spot for a porch swing or rocking chair. Enter into the living room and notice the easy care laminate wood floors found in the living and dining areas, crown moulding, refreshing lighted ceiling fan, and a window overlooking the front yard allowing natural light to to fill the room. An archway creates a subtle separation of space between the living and dining rooms. The dining room features a lighted ceiling fan, crown moulding and is adjacent to the kitchen with white cabinetry, refrigerator, stove, and double sink. A door in the kitchen leads to the walkout basement below, offering a second entryway. Both main level bedrooms are spacious, especially the large master, and the full bath features a shower over tub. Outside, relax in the yard with mature shade trees and enjoy the beauty that surrounds you. Additional features include central heating and air, off-street parking, and a walkout basement providing easy access for storage. To receive info and pictures to your mobile phone, text “SDG2” to 79564.